Truly the only real way to experience Big Sky is to play it. To breathe deep the crisp, clean mountain air. Then line up your shot, with the ever-present and massive Mount Currie always keeping watch over the Pemberton Valley. However, if you can’t get here right now, or you simply can’t wait to get here, our golf course tour is the best way to understand the impressive layout and some tips and tricks how to play each hole on the course. 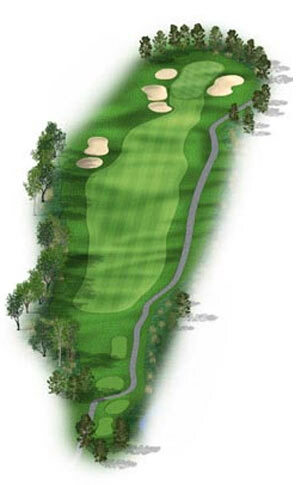 Number 1 is straight-away par 4 and a good warm up hole, preparing you for a round of thoughtful shot-making. You'll find generous landing areas from the tee, encouraging you to swing away with your driver. A long to mid iron should get you to the green in regulation. Putts will roll fast and true over the firm, 2-tiered green. Avoid the fescue left from the tee and right on the approach and you'll be off to a strong start. Find the fairway with your drive and you'll be hitting a mid or sort iron approach. 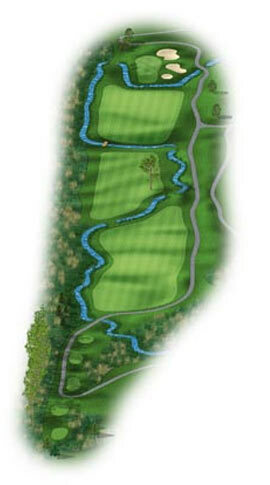 This dogleg left features many subtle slopes and undulations. Aim for the right side of this green; shots to the left will roll into the hazard. Too long and you'll catch the backside bunker. Be sure to take your time and appreciate the magnificent mountain and big sky panoramic views of this hole. 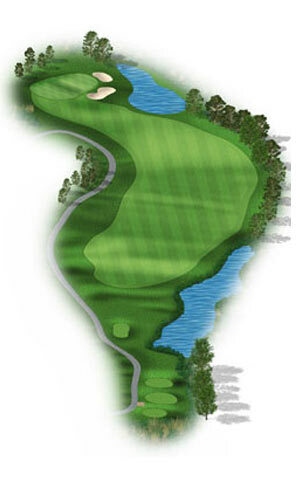 This benign looking par 3 holds a few surprises. The tee shot is slightly uphill to an off-centered back-sloping green. 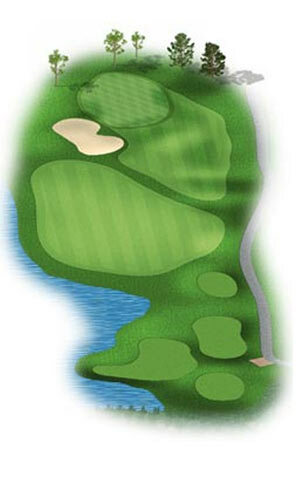 Favor the right center of the green; balls landing left or long are tough to get up and down. A pronounced crown runs laterally across the green and can make longer putts very interesting. Number 4 has earned its name by causing more problems for more golfers. A good tee shot is essential for making par. Trouble abounds: a creek crosses the fairway in 4 different locations, 3-foot high fescue is growing along the right, trees line the left. However, the fairway is quite wide and provides large landing areas. A long but narrow green is tougher than it looks. The huge green at Number 5 may seem like welcome relief after the last hole, but don't lose your concentration for one moment. Much of the right side slopes off to a grassy collection area. Hit to the center and you'll be facing a ten to fifteen foot birdie putt most days. 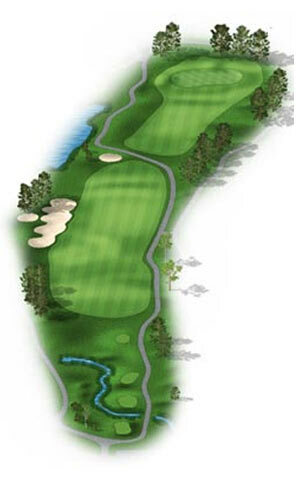 Leave your driver in the bag at Number 6, a short, tight straight away par 4. 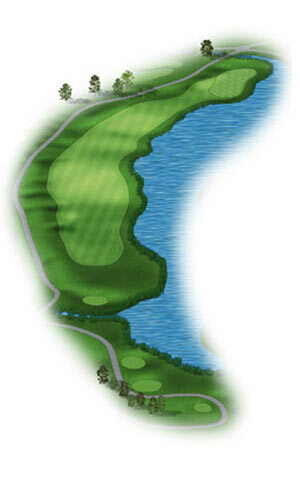 A safely played fairway wood or long iron leaves a short iron approach to a deep, narrow green. Multiple bunkers left and right put accuracy at a premium. This can be a good hole to pick up a stroke. 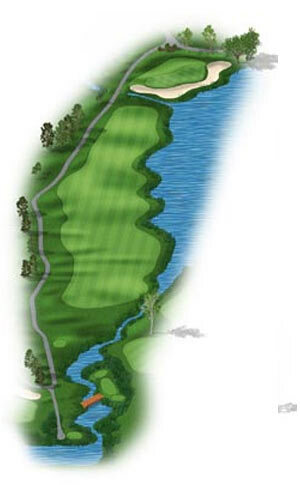 Number 7 requires an accurate drive to avoid the right-side water and fescue left. From the flat fairway you'll have a good stance for hitting your mid to short iron approach. 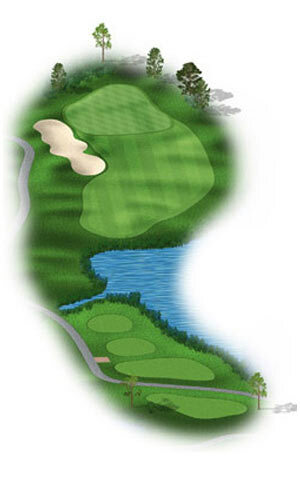 Play to the center of the well protected green; balls hit to the right will ride the steep slope into the hazard. 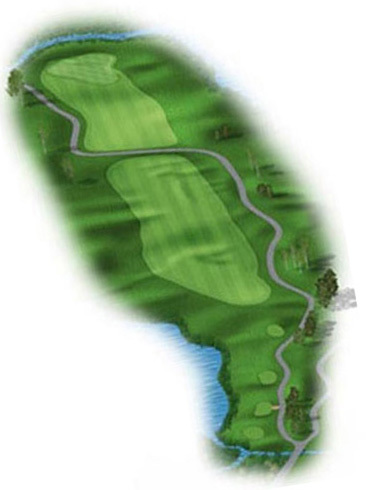 This straightaway par 4 features a well-bunkered fairway and a left side water hazard that comes into play on your approach. Aim right. The left side of the kidney bean shaped green slopes toward the water. Be careful of the mound that cuts across the middle of the green. The front nine concludes with a good three shot par 5. Long hitters should be able to reach a collection area just short of the elevated green in two an ideal position for an up and down birdie. Water left and some nasty fescue right will cause problems for the misdirected. 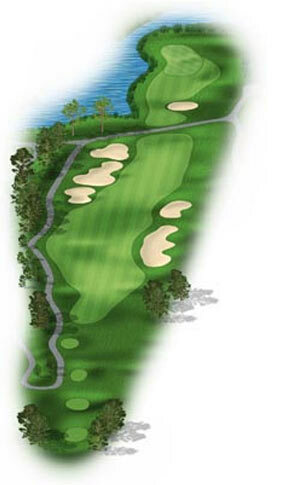 The backside greets you with a dogleg right par 4 with a very wide, accommodating fairway. Approaches hit from the right center have a good line into a wide but shallow, unprotected green. Club selection is critical as it is tough to get up and down from behind the green. Number 11 has a slightly elevated tee overlooking lush landscaping, bulrushes, and cat tails standing tall along the left side water hazard. The green sits side saddle to the tee box; distance control is vital to scoring well. Hit to the right center of the green. An aggressive play to a back left pin placement can easily catch the front left bunker or the water. Good luck. Get ready for another skills challenge. 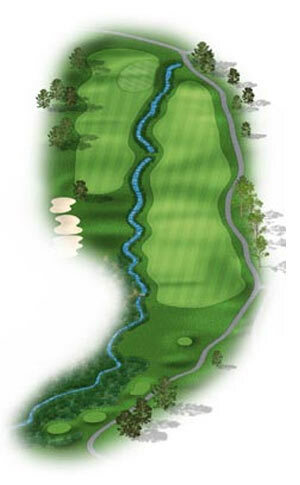 A creek splits the fairway and forces all but the longest hitters to play up. 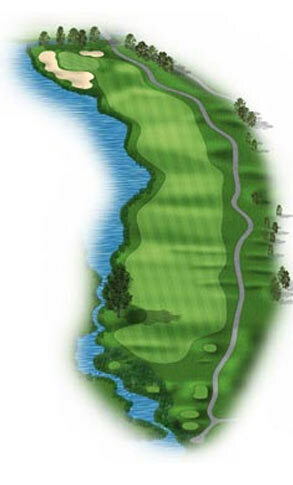 Because the creek cuts in front of the green, approach shots to the center of the green are the smart play. 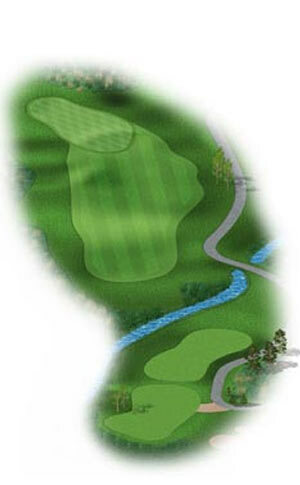 Over-clubbing will create different problems; there is a steep drop-off behind the green. 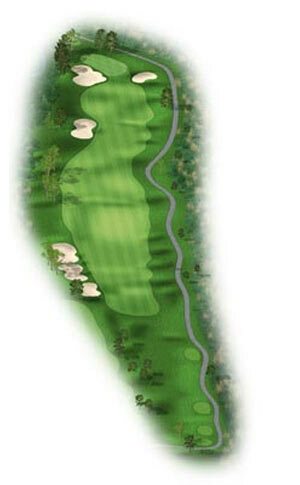 A wide fairway and generous landing area for your second shot can make Number 13 your lucky scoring hole. Long hitters can go for the green in two. The rest of us can play it as a "on in three" and have a comfortable short iron to a large, smooth rolling green. As you step up to the tee, look up at the incredible sights of Big Sky's signature hole. Mt. Currie rises in the distance, surrounded by clouds that get caught in the adjacent mountain tops. The setting encourages you to pull out the big dog and let it fly… your drive will look like it has been suspended in mid-air. 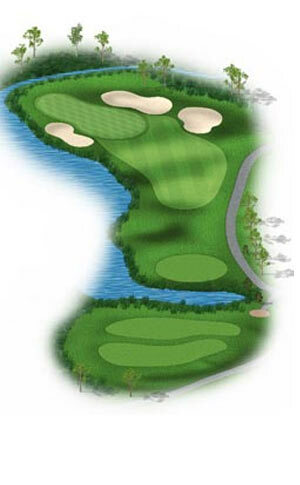 With water left and multiple bunkers protecting the green you'll need to hit a good approach shot to score well. 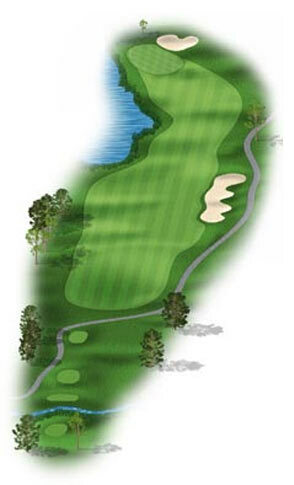 Number 15 is a short dogleg left and requires careful club selection. Use a fairway wood from the tee and a short iron approach. 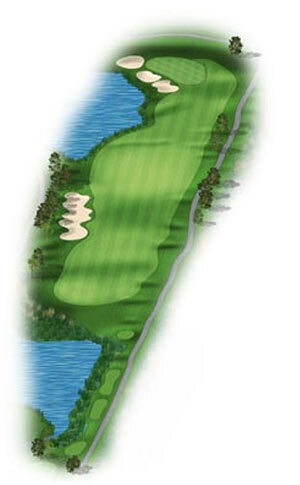 The 2-tiered green is shallow from front to back; you could easily find yourself facing a demanding 2-putt to save par. There's a good reason for this hole's name… you'll need to take one before hitting your drive and approach. A tight fairway, an even tighter landing area and a water hazard flowing along the entire right side will put most golfers' nerves to the test. The left side collection area next to the raised green is sometimes the smartest play. Number 17 is the longest par 3 at Big Sky. Aim right to avoid the left side bunker. A mean ridge gives the green it distinctive character. Take your two putts and head for home with a feeling of satisfaction. 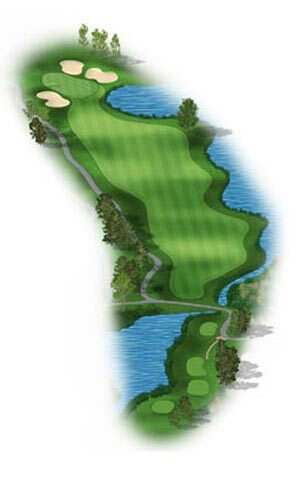 A great finishing hole…this three shot par 5 will require solid, controlled shots to avoid the water hazard running the length of the hole and the monster wrap-around bunker protecting the green. A decent drive and mid-iron will set you up for a tricky wedge in. Play to the left to give yourself more green to work with.